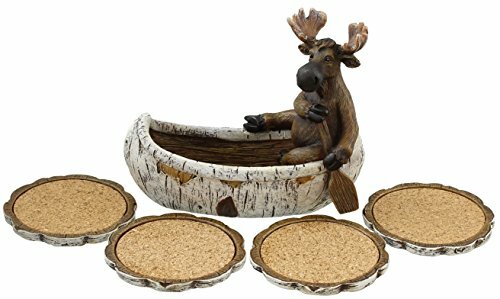 Whimsical Moose Canoeing Coaster Set - (4) coasters and holder from Old River Outdoors. Holder and coasters made from hard, durable poly-resin material. The coasters are lined with cork. Holder and coasters have rubber feet. Coasters measure approximately 3 1/4" diameter.